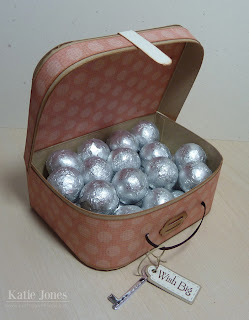 It's another 3-D Wednesday with My Creative Time, and I've got a really fun project for you! This was a little birthday gift for a friend at school. 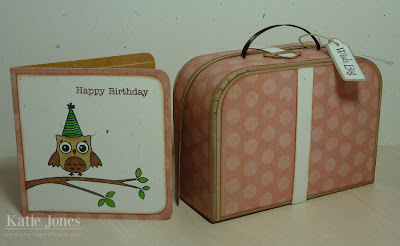 To make my adorable suitcase, I used a cut file by Lori Whitlock that I found in the Silhouette Online Store. Isn't it the cutest? 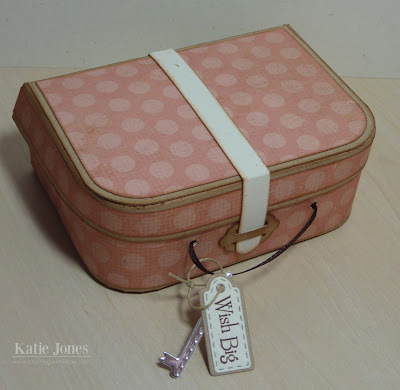 I added a key and a little tag made with My Creative Time's Chunky Jar Accessories stamp and die set, tied to the suitcase with some Thin Kraft Hemp from Liz's Paper Loft Boutique. Here's a look at the inside. It's filled with some yummy dark chocolate! I made a coordinating 3x3 card using the new MCT Birthday Buddies stamp set and had some fun coloring the images with my Copic markers. Be sure to click on the link below to stop by My Creative Time to see what Emma and the rest of the design team have to share with you today! Unbelievable I saw the little suitcase and then read your description blinked my eyes looked back at the suitcase re-read your description as thought I'd read it wrong what the heck you made the suitcase WOW and then there's the rest the darling card the key the tag gosh girl you are something else a good and talented something else.... in a word WOW!!!!! I feel like I could pickup that little suitcase and head to the airport in style...love it!! That little suitcase is adorable. What a thoughtful gift. what a cute creation, and yummy chocolates to top it off with !!!! This is adorable! I haven't tried that suitcase yet...but I will have to now! What a cute idea...and you did a fab job. What a cute gift...yummy! The suitcase and card are so cute. Love the tag and key and the coloring on the stamp are great. Wow want a beautiful gift Katie! Im sure she loved it! Great job! This is so cute, Katie. Love the colors. I was wondering, could this file be adapted to the Portrait? How stinkin cute! Love that it's filled with chocolate too! Great job! Kaite ~ OH MY WORD!!! This is seriously ADORABLE ~ BEAUTIFUL and STUNNING all wrapped in one! I LOVE this little luggage and card set! EEK! This is a SHUT THE FRONT DOOR kind of project in my eyes! I am so making this little guy! I bet she LOVED it!